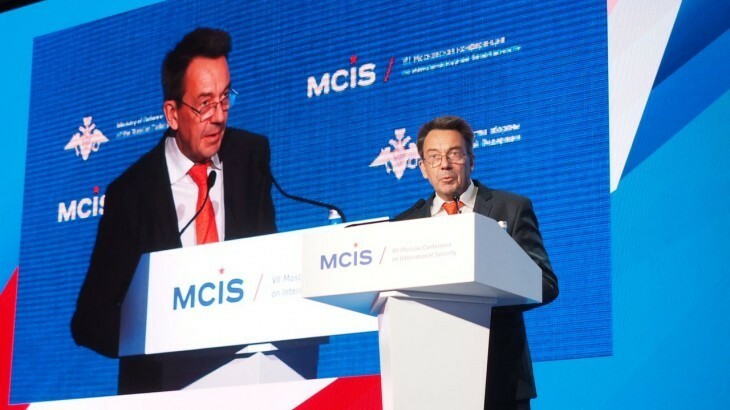 Speech given by Mr Peter Maurer, President of the ICRC, during the Conference on International Security (Moscow). It is a great privilege to be here today. Thank you to the Government of Russia, and in particular to the Russian Minister of Defence Sergey Shoigu for the invitation to address this important event. The Moscow Conference on International Security is an important platform to exchange on key global issues, including those related to humanitarian concerns in today’s armed conflicts. I would like therefore, to give you an overview of the ICRC’s analysis of global trends in contemporary battlefields, rooted in its frontline knowledge and engagement with different belligerents; and to highlight two key areas for further dialogue between military-security and humanitarian actors. For more than 150 years, through its neutral and impartial humanitarian action, the ICRC has amassed key insights and experiences as a frontline actor in favour of humanitarian space and as neutral intermediary between belligerents. These insights have informed our legal work, while principles and policies are guiding our practical response in almost all active conflicts. In recent times, we’ve seen a strong new trend emerging, which defies the distinction between internal and international armed conflict, as articulated in the Geneva Conventions of 1949 and their Additional Protocols: We now see protracted situations of long-term violence continuing to rise with local, regional and global actors involved, with different types of support for partners and allies and opposing, often volatile, coalitions of State and non-state actors. While each conflict has its particular dynamics, it is shocking to see the deep humanitarian impact of such fundamental transformations, which often is accompanied by a blurring of lines between civilians and militaries and an unwillingness and inability to adequately protect those who are not participating in hostilities. Exponential growth of needs, combined with limited response capacities, are leaving millions of people without hope for a dignified life. and as a consequence, human suffering, social systems falling apart and massive displacement. Whatever the motives by which present day warfare is legitimized, this cannot be an acceptable result for responsible leadership. – The annual economic impact of conflict and violence is $14 trillion – or 14% of global GDP. Today’s conflicts are increasingly protracted, causing compounding impacts on populations. While the ICRC was created as a humanitarian organisation to respond to emergencies, we find ourselves working for decades in protracted contexts. In our ten largest operations, we have been on the ground for an average of 36 years… and still the wars continue. The urbanisation of warfare is one of the important factors contributing to this bleak picture of suffering. Around the world, it is estimated that some 50 million people suffer the effects of urban conflicts. Cities and urban areas are intrinsically more vulnerable, especially to the use of massive explosive force and more amenable to illegal tactics of human shields. Because of the significant likelihood of indiscriminate effects, we urge all parties to avoid the use of explosive weapons with a wide impact area in densely populated areas and to stop taking the civilian population hostage. The consequences are devastating – not only in the immediate impacts of death, injury but also in the erosion of basic infrastructure like health, water, sanitation, education systems. A sober analysis of our working environment tells us that our mitigating efforts through humanitarian assistance programs will have limited success if we do not make major efforts to shrink the needs through changes of behaviour in the battlefields. This will come first and foremost from respect for the rules of war, in particular the principles of distinction, proportionality and precaution. Now I will turn to two critical areas of response – the dimensions of partnered warfare and of new technologies and cyber warfare. Today no one fights alone. In many of the major conflicts in the Middle East, in Africa and beyond, coalitions pool their resources against common enemies. We see wars that are fought by proxy; through both official and unofficial partnerships. This can create a climate in which political and military stakeholders see themselves freed from the scrutiny of accountability processes. Partnered warfare comes in different forms. Focuses can be on advice, training, equipment, surveillance, intelligence sharing, logistics, combined operations, kinetic support, detention operations and more, depending on circumstances. In light of the global trends of conflict that we are witnessing, it has become increasingly urgent for States to look at how they can better leverage their partnerships and support to ensure civilians are better protected. The ICRC has developed a series of practical recommendations for States supporting parties to an armed conflict. To put it plainly, allied States have a responsibility to make sure their partners are not taking the cheap options. – and ensuring proper application of the rules governing the conduct of hostilities, detention and protection of civilians. And to make a particular note on the arms trade. Arms transfers are at the highest levels since the end of the Cold War, with a significant proportion going to those fighting in the most brutal of wars. States have a special responsibility and must use their influence to ensure partners respect IHL, and cease transferring weapons, where there is a substantial or clear risk that the weapons would be used to commit IHL violations. I believe there is huge untapped potential for States to positively use their influence over those they partner with or support. I have seen the positive impact when allied States do take such steps and measures and I encourage all States to examine their responsibilities and actions. Indeed, we look forward to constructively furthering this discussion with States over the coming year. In today’s world, while major conflicts are happening in the physical world with kinetic power, we can’t ignore the new battlefields. New technologies are rapidly giving rise to unprecedented methods of warfare. Innovations that yesterday were science fiction could cause catastrophe tomorrow, including fully autonomous combat robots and laser weapons. Cyber-attacks are a growing issue of concern because of their potential for serious humanitarian consequences. The ICRC is urging States to look at the humanitarian impact of conflict in the virtual world and to uphold the protections afforded by the law. In the ICRC’s view, it is clear that the general rules of international humanitarian law apply to and restrict the use of cyber capabilities as means and methods of warfare during armed conflicts. IHL prohibits cyber-attacks against civilian objects or networks, and prohibits indiscriminate and disproportionate cyber-attacks. At the same time ICRC is raising critical questions such as : What is a security incident versus an act of war? How can cyber-attacks distinguish between civilian objects and military objectives? How to assess their proportionality? And what are States’ views on these questions? The interconnectedness of military and civilian networks poses a significant practical and legal challenge in terms of protecting civilians from the dangers of cyber warfare. These challenges must be addressed. They also underscore the importance for States that develop or acquire cyber warfare capabilities – whether for offensive or defensive purposes – to assess their lawfulness under international humanitarian law. To be clear, by asserting that IHL applies to cyber means and methods of warfare, the ICRC is not condoning cyber warfare or the militarization of cyberspace. Any resort to force by a State, whether physical or through cyberspace, remains constrained by the UN Charter. The point is that – beyond the requirements of the UN Charter – IHL further restricts the use of cyber capabilities during armed conflicts. I have focused my address today on the critical importance of international humanitarian law to prevent and mitigate the impacts of war. As seen in our recent history, when the law is respected, the cycle of violence can be broken, the impact of war contained and the foundations built for future peace and security, and much needed political solutions. International humanitarian law is an inherently practical tool. It can shape behavior and influence those bound by it to exercise restraint. Each of its rules contains a balance between humanity and military necessity, allowing armies to exercise common decency. The law provides a basis, a shared language, for warring parties to eventually come to the table, and find common ground. In today’s world where protracted, urban wars are the norm, when brutal conflicts are causing untold human suffering, we must use the tools at our disposal to break the cycle of violence and instability, and we must start work today.